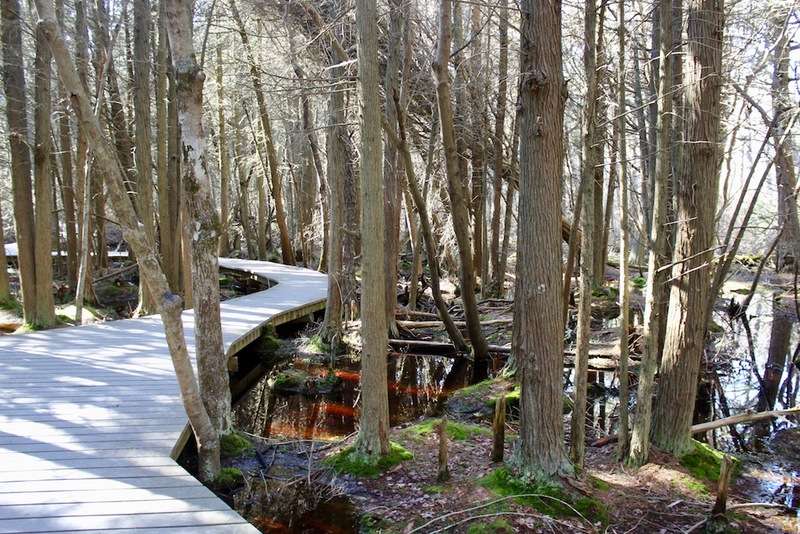 WELLFLEET – There may be no more diverse habitats in such close proximity on Cape Cod than at the Atlantic White Cedar Swamp near Marconi Beach. One minute you are looking out over a 75-foot dune at miles of Cape Cod National Seashore beach. But a short walk down a nearby path will bring you to an otherworldly rare swamp environment where a boardwalk snakes through a primordial forest. The one-mile trail passes by low scrubby bushy plants like broom crowberry and black huckleberry, before entering the swamp where the Atlantic White Cedar trees compete with red maples and white oaks. On a recent sunny blue sky day, the swamp trail was eerily quiet as bands of reddish water and mossy tree trunks were speckled with occasional rays of sunlight that managed to sneak through the forested canopy of the swamp.